Everything Just Sew: Yeah I can crochet! There are no sewing mistakes - only opportunities for design features. After my eight questions yesterday I wondered if I still had any of my early crochet efforts. 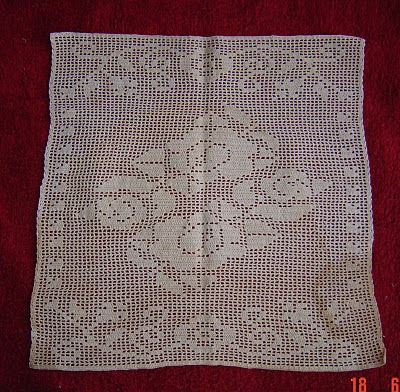 I know that somewhere I should still have the round pineapple pattern doily?tablemat? I made 20 odd years ago but it might take a bit of searching to find! 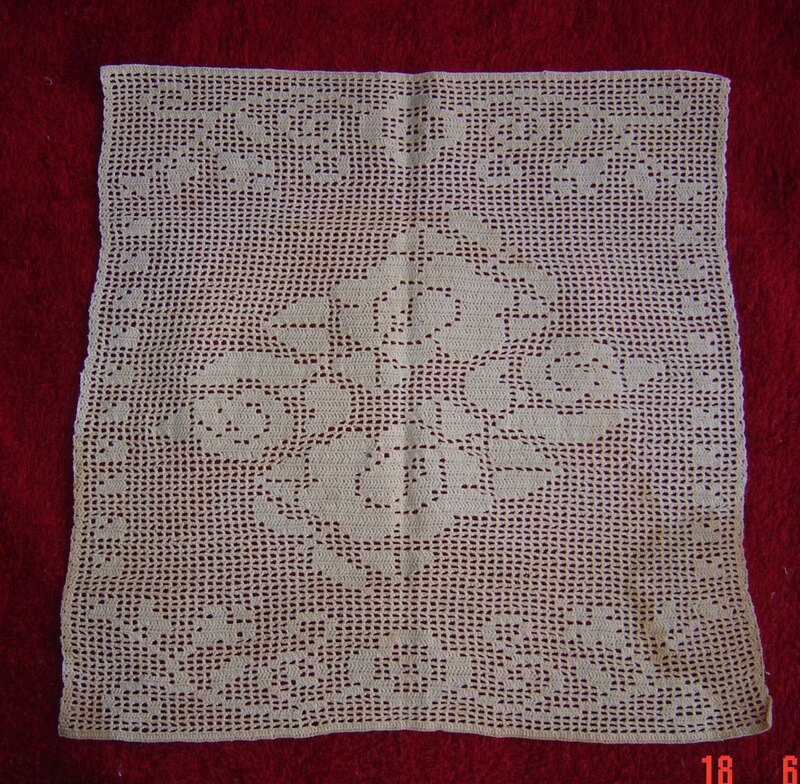 I did however find this piece of filet crochet which I am fairly sure is at least 20 years old. It is rather stained and I had a horrible feeling that I had washed it before putting it away, and after washing it again and not even slightly shifting the stain I'm pretty sure that this was the piece that was sitting on a stained wooden coffee table which got water spilled on it. I think the stain is wood stain which leached out of the wood. Oh well, I can always dye it! And when I came back into the room after photographing this I was met by this sight. 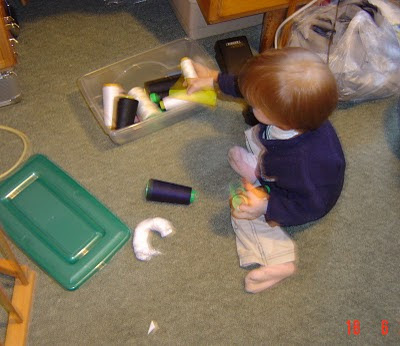 It's blurry, but you can make out in Nicholas's right hand an empty overlocker thread cone, and on the floor in front of him the white thread which he has pulled off the cone. Sigh. Oh no! Why are they obsessed with thread??? Mine find endless enjoyment in unrolling bobbins. They're like cats. Really really dumb cats. Or at least, mine are. And they're 6 and 7.
word verification? "thendol" It's the drug you give to cats so they don't unravel all your thread. Think it would work on small children? Yeah. Didn't think so. LOL at 'really really dumb cats'. But remember: you cannot train cats but I have found that consistent yelling and dire threats have resulted in an almost Pavlovian reaction to thread in my children: see thread (or wool), shudder, ostentatiously sit somewhere else. You have to sacrifice a lot of Lovely Mummy points in order to achieve this, but it's been worth it. And my children will of course wreck my sewing room tomorrow because, as we all know, smuggery in parenting will always sneak around your back to bite you on the bum. "We never, EVER, touch mummy's machines!" This is said in my house waaay too often, but then when you have twins EVERYTHING is said way too often. I've enjoyed having a browse around - I love the DIY covered buttons, and I totally understand about needing to re-do something because you just can't stand looking at it the way it is! It only takes seconds for them to do something that we couldn't do if we tried. Your crochet is gorgeous! What a terrifying thought. Madeline turns 6 mos on Wednesday, and can sort of wiggle on and off a large rug. My sewing area is completely unprepared for such an assault. I'm going to show this to DH and say (for the hundredth time) I have got to get a proper sewing area, STAT! Who am I? I'm a lifelong sewer with a degree in Clothing and Textiles so I can pretend I know stuff, and a husband and five kids to remind me that there is more to life than fabric. I sew because I love it. People who inspire me, or make me laugh. Or both. The Housework Will Still Be There Tomorrow! My Creative Space - It's all about ME!